Thine is The Kingdom: MUSIC - Friday at Noon Soundtrack Available for Purchase! 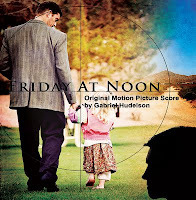 MUSIC - Friday at Noon Soundtrack Available for Purchase! Praise The LORD, my first CD release is available for purchase at a two-week kick-off price of $8.00! Buy your own copy at fridayatnoon.com/shop! This album contains just over an hour of music, including extras not heard in the film, and it ranges from soft piano lullabyes to the weeping of a solo violin to the intensity of orchestral action music. Here's the main theme - Track 1 from the album, entitled "Someone Will Pay." Thanks, Lisa. LORD willing, we'll see you then!